The second edition of Chitin underscores the important factors for standardizing chitin processing and characterization. 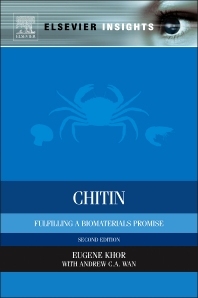 It captures the essential interplay between chitin's assets and limitations as a biomaterial, placing the past promises of chitin in perspective, addressing its present realities and offering insight into what is required to realize chitin's destiny (including its derivative, chitosan) as a biomaterial of the twenty-first century. This book is an ideal guide for both industrialists and researchers with a vested interest in commercializing chitin. Dr. Eugene Khor, Chiticore Enterprises Inc. Victoria, Canada.